VIENNA TOWNSHIP, Ohio – When Lezlie Chronister’s husband’s dog died, he wanted to get another. But Chronister’s answer was matter-of-fact. Her answer didn’t sway her husband who ended up going by himself to the Animal Welfare League of Trumbull County and adopting a pit bull named Leah. Quite a gamble, it would seem to anyone reading this article. But it worked. Although Chronister didn’t grow up with a dog, it didn’t take long for Leah’s demeanor and “unconditional love” to make her a dog person, she says. In fact, Chronister was the one who decided it was time for yet another dog because Leah “needed a buddy,” she says. 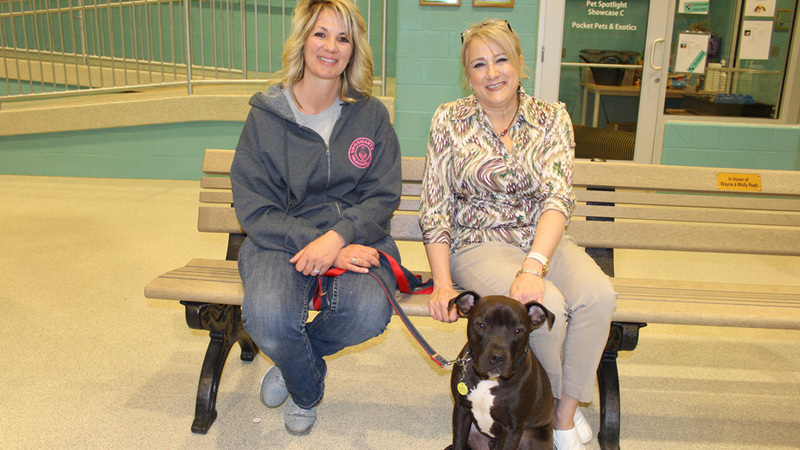 This time, she accompanied her husband to the Vienna Township shelter and met Sparky, a pit bull-terrier mix who turned one in April. Taken with the puppy, the Chronisters arranged a meet-and-greet with Leah at the shelter. “Those two hit it off real well,” so they decided to go through with the adoption. Things have been good at home, she says. Shelter staff helped with the adjustment period and Sparky lives comfortably in his new home. Sparky is a graduate of the prison training program of the shelter, which it runs through the Trumbull Correctional Institution in Leavittsburg. Dogsmartz Unleashed of Poland oversees the program that helps some of the more unruly dogs improve their house manners, says its owner, Jenny Falvey. Dogs chosen for the program are sent to live with preselected inmate handlers who care for the dog for nine weeks. Inmates help dogs learn how to behave in the house, not to jump on people and how to walk properly with a leash. The program places 12 to 15 dogs every nine weeks. That number is gradually increasing as more handlers are trained, she says. The program supplements the efforts at the shelter to place dogs in forever homes, where animals can be adopted and live out the rest of their life, says Executive Director Gary Pilcher. Placing animals such as Sparky in a forever home is central to the mission – Rescue, Rehabilitation, Adopt and Education – that the 501(c)(3) has pursued since its founding in 1969, Pilcher says. “The faster we can get them adopted out to a forever home, the more capacity we have to take more animals in,” he says. The shelter operates almost entirely on donations. and the work of its 100 volunteers, plus revenue from the on-site Have a Hart Pet Store and the Menagerie Thrift and Gift Shoppe in Warren. The Menagerie alone brings in thousands of dollars annually, “so it’s a significant fundraiser for us,” he says. Volunteers work at both retail sites as well as the shelter, caring for the animals and cleaning cages. There is always room for more volunteers, Pilcher says, even if they can only devote a few hours weekly or monthly. As funding comes in, the shelter – a 40,000-square-foot building on Youngstown Kingsville Road, continues to build its capacity. Between its kennels and cat condos, the shelter can handle 150 dogs and cats and annually arranges for adoptions of about 400 of each, “plus miscellaneous snakes, guinea pigs, turtles … a lot of rabbits,” Pilcher says. Animals arrive as strays and some are seized in cases of hoarding, neglect or cruelty. Rescuing animals from that type of situation is a big sticking point for the mission of the shelter, he says. Animal Welfare League has humane agents on staff who enforce Ohio laws against animal abuse and neglect, up to and including arrest. In other cases, animals are perfectly healthy and the owners can no longer care for them. Regardless of how the animals get there, they are examined, provided with any needed medical care and then an adoption is arranged. Typically, animals are held for 10 days to ensure they’re safe for adoption. Cats are tested for leukemia and feline immunodeficiency virus, or FIV, and will only be set up for adoption if they test negative. Upper respiratory infections are common in shelter cats, Frost says. Cats are quarantined and treated with antibiotics until they are back to good health. “Our cleaning procedures are very effective in maintaining any infection control here so that we don’t have a lot of disease passing through animals to animals,” she says. The shelter works with a veterinarian who comes in weekly to give animals checkups and will outsource work to nearby clinics should an animal have needs that the shelter cannot provide. Puppies and adult dogs are kept in separate kennels and have their own exercise and training spaces to help prevent cross-contamination in the case of illness. They also get playtime in outdoor yards. Private bonding rooms are available for people looking to adopt. “There’s a right family for each animal,” Frost says, and prospective adoptive families can spend time with the animals under the supervision of a caretaker, who will answer any questions the person has. “If they’ve found one that they’ve chosen, they’re able to fill out an adoption application. Because we want to do some kind of screening to make sure they’re going into a forever home,” she says. To be considered a forever home, the applicants must ensure any animals they already have are up-to-date on rabies vaccines, as required by law. Once approved, the applicant can adopt the animal that day as long as it’s been spayed or neutered. Otherwise, the animal can go home with the family the day after surgery. To help with the transition, Dogsmartz provides on-site obedience training to get all animals ready for homes. New owners can attend classes to help create a bond with their pets, which is helpful in enforcing any training the dog has learned as well as helping the dog adjust to a new home, says Dogsmartz’ Falvey. Pictured: Jenny Falvey from Dogsmartz is training Sparky, a pit bull-terrier mix who has been adopted by Lezlie Chronister. Training takes about six weeks to build a baseline foundation, she says. Classes are taught five days a week and begin with basic obedience, including housebreaking, chewing and barking. Three higher levels of classes teach dogs tricks as well as confidence-building and impulse control. And yes, Falvey says, you can teach an old dog new tricks. As for Sparky, he’s enjoying his life at the Chronisters, household, especially playing with Leah in their big backyard, Lezlie Chronister says. “They just enjoy running around and playing and having a good time,” she says. Pictured at top: Kayley Frost manages the shelter and Gary Pilcher is executive director of the Animal Welfare League of Trumbull County.